Please Note: that as more information is finalized or becomes available this page will be updated. All competitors must complete a bike and helmet check prior to the race through our partner More Bikes.. Bike checks are to confirm that you fulfill your TriBC safety requirements, regardless of the last check you may have completed. Bike checks can be done on race day, or you can save time and get them checked on race package pick-up day. Details will be sent to participants after the registration deadline. Race packages can be picked up on race day, or save time and collect your race package from Rackets & Runners in advance on March 6th and 7th, times TBD. You'll need to show Government photo ID and sign a waiver. The bag serves as your wet bag on race day and includes your race number and safety pins, event information and race day procedures, sponsor products, upcoming event information, and technical t-shirt (if purchased). Details about race package pickup will be sent to participants after the registration deadline. Please Note: that all members of relay teams must be present to sign a waiver in order to receive the team's race package. Participants will be given a bag when they pick up their race package. Fill it with anything you would like to have following your swim (e.g. towel, change of clothes, flip flops) and drop it off with our staff on the pool deck on Race Day. After your swim, your wet bag will be handed to you as you exit the pool and before you get changed. You can also leave your wet bag at the pool and it will be available at cycle trans following your race. For the safety of all participants and spectators, all competitors must follow the rules of Triathlon BC. It is recommended that participants visit the Triathlon BC website and familiarize yourself with the rules. We also have strict guidelines for keeping your race on schedule - UBC Recreation will disqualify participants that exceed the maximum swim times: Olympic - 45 minutes, Sprint/Relay, - 28 minutes Short - 20 minutes. Participants disqualified for exceeding the swim time will be asked to leave the pool and may continue on to the cycling and run portions on the race, but will not be ranked. We offer our TriDu Technical (poly) T-shirt's in S, M, L, XL and XXL for $32. Order yours online by February 20th, 2019. Contact ubc.triathlon@ubc.ca for more information. Triathlon 101 clinics are designed to guide participants through race day procedures. We will touch on the route, and participants can ask any questions about the race they may have to our race director. No RSVP is needed for the clinics, all registered participants are welcome to show up on the date and time of the event. 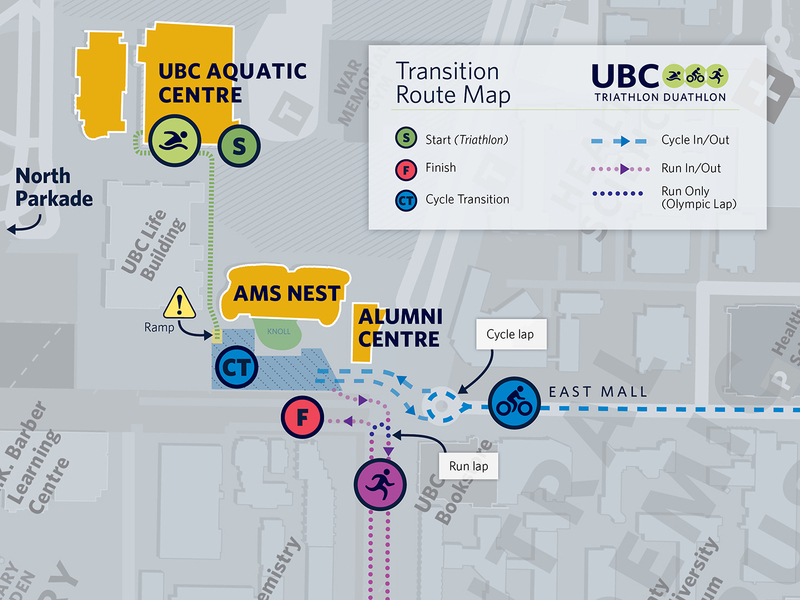 If you have any questions please contact ubc.triathlon@ubc.ca. We're always looking for volunteers to help make this event a success! You'll have a blast with our staff, get a complimentary volunteer shirt, and we'll provide you with food throughout your shift. Opportunities are available at registration, finish line, and on race route. Sign up by filling out our volunteer form. 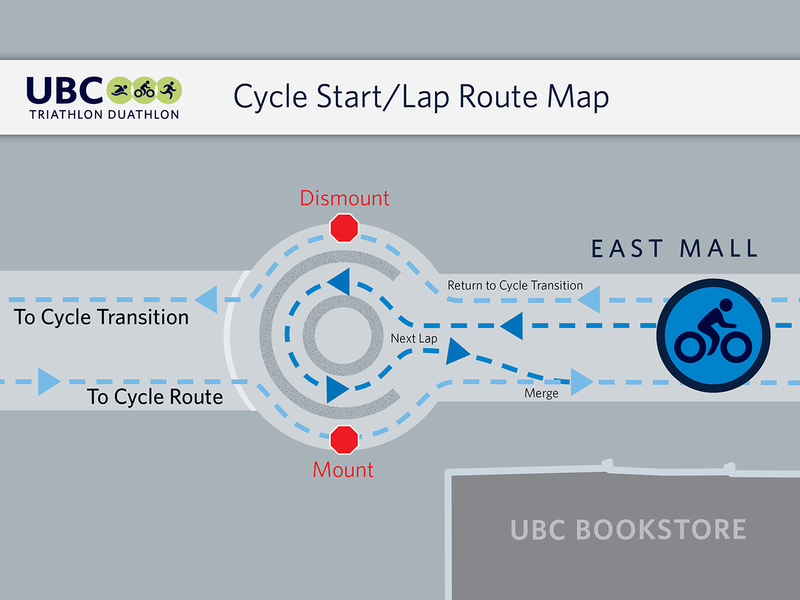 If you have any further questions please feel free to email ubc.triathlon@ubc.ca. Thank-You for Participating in the UBC Triathlon Duathlon!